* Putonghua is adopted as the medium of instruction for Chinese Language. The Student Financial Assistance Agency has mailed the captioned application results to the applicants who have submitted application for assessment of eligibility. To facilitate the assessment process, please complete and return the Eligibility Certificate to the class teachers on / before 6th September, 2016 (Tue). The scheme is applied on a 'family-basis' and the Student Financial Assistance Agency has mailed pre-printed family-based Application Form B to applicants who were granted financial assistance in 2015/2016. ⚫ mail the completed application form together with all the supporting documents to the Student Financial Assistance Agency directly. To be eligible for applying for the captioned maintenance grants, the student-applicant must be a Hong Kong resident who is not in receipt of Comprehensive Social Security Assistance in his/her own name or under the applicant's family. Repeaters will not be considered except under very special circumstances. The application form together with the supporting documents should reach Mr. Yu Kin-man, Vice-principal, at the General Office on/before 15th September, 2016 (Thu). ii. Bank in to the account 285-120754-003 (Hang Seng Bank - Bank Code: 024). Bank-in slip should be submitted to the class teachers on/before 6th September, 2016 (Tue). For PPS bill registration procedures, please refer to the Information for PPS Bill Registration printed on P.10. Besides, parents are advised to keep a proper record of the transaction for checking purpose. At the end of an academic year, any unused balanced will be tallied and carried forward to the next academic year. Upon graduation, any remaining balance will be returned to students via a cheque. Please submit fees listed in the table on P.9 by cheque to the class teachers on 2nd September, 2016 (Fri). ⚫ have the cheque made payable to "The Incorporated Management Committee of Munsang College"
c. If parents have two or more children studying in Munsang College, refund of the overcharged amount for the membership fee of Parent-Teacher Association can be applied for in the General Office from 5th to 9th September, 2016 while refund of the overcharged amount for “Voice 2015/16” (Year Book) can be applied for from 11th October, 2016. The reply slip should be returned to the General Office on/before 21st October, 2016.
d. For iPortfolio (9) and Smart Card (10), the charges are ONLY applicable to the newly-admitted students (NOT for F.1 Repeaters). Students who have lost the cards should approach the General Office for replacement. With reference to EDB Circular No. 46/99, the College has been given approval to collect HK$25.00 for the second copy of testimonial or transcript from students. Accordingly, applicants must submit HK$25.00 for each succeeding copy, other than the first copy, of the testimonial or transcript to be issued by the College. In order to provide our students with better support services, you are invited to supply the information of your children's medication condition by completing the Table on P.11 and returning it to the Class Teachers on/before 5th September, 2016 (Mon). It is our objective to provide students with balanced development in integrity, intelligence, physical fitness, gregariousness and aesthetic. Physical Education is therefore a compulsory subject in our formal curriculum and all students must attend P.E. lessons. If a student suffering from serious health problems (e.g. chronic heart disease, injuries, surgical operation, and other diseases concerning internal organ or acute infections) wishes to be given exemption from P.E. / swimming lessons either temporarily or on a long term basis, application should be made to the Physical Education Department of the school on/before 15th September, 2016. The application should be in the form of a letter signed by the parents of the student, together with a medical certificate given by a doctor practicing western medicine. The student who has been granted exemption is still required to attend the P.E. lessons as an observer. Furthermore, he/she will not be allowed to participate in any extra-curricular sports activity until a written application to resume his/her P.E./swimming lessons is made by his/her parents. The school holds no liability in this connection. We therefore urge you as parents to make an early application to the school pursuant to this letter if you consider that your son/daughter cannot do vigorous physical exercises either temporarily or on a long-term basis. Appropriate arrangements will then proceed accordingly. a. As advised by the Centre for Health Protection (CHP) of the Department of Health (DH), outbreaks of communicable diseases such as human swine influenza, influenza, chickenpox, norovirus and hand, foot and mouth disease may occur in institutions and schools from time to time. b. Before the commencement of the new school year, we have thoroughly cleaned and disinfected the school premises. We would urge all students/staff members to pay attention to their personal hygiene and environmental hygiene of the school. - Seek medical advice as soon as possible if your children develop symptoms of diarrhoea, vomiting and skin rash. If symptoms such as fever, sore throat or cough are developed, they should put on a mask immediately and seek medical care from designated influenza clinics as soon as possible. Please also notify the school and let the children stay at home for rest until symptoms have improved and fever has subsided for at least 2 days, or follow the medical advice on sick leave, whichever is longer. - Children with hand, foot and mouth disease (HFMD) should be excluded from schools until fever has subsided and all the vesicles have dried and crusted. As an extra precaution, children with EV 71 infection should not go to school for another two weeks after all symptoms subsided. - Inform the school immediately if children are sick or have been admitted to hospital for surveillance. - Co-operate with the school by picking up children not feeling well from school and consulting the doctor immediately. - Provide children with handkerchiefs or tissue papers and remind them not to share towels or tissue papers with others. - Remind children to keep hands clean, cover nose and mouth while sneezing or coughing and dispose used tissue paper properly. - Before sending children to school, measure their body temperature, record the reading and sign the temperature record sheet which is available in Student and Parent Handbook 2016/2017. The control measure will take effect from 5th September, 2016 (Mon). Please ask your child to present the temperature record sheet to his/her class teacher for checking every day. Students who fail to do so have to pay an amount of $3.00 for temperature checking at school. d. Again, we would like to appeal to parents’ co-operation in maintaining a clean and healthy household environment. Please remind your children to pay attention to personal hygiene and to take all necessary preventive measures against communicable diseases. 1. To help students in managing their Careers & Life Planning (CLP), we have adopted a set of career tool books published by Hong Kong Association of Careers Masters and Guidance Masters (HKACMGM) to be used in students’ CLP sessions and activities. F.2 to F.3 students will use “Finding Your Colours of Life” ($15 per copy) whereas F.4 to F.6, Career Mapping ($27 per copy). Please remind your children to keep good custody of these tool books as they will be used during their years in school. F.1 students will receive a free green file for keeping careers materials. 3. To go green and reduce paper consumption, Careers Programmes to be held on campus after class will be uploaded to the “School Homepage CCA Portal” and also printed on “Message from the Principal”. There will NOT be any extra circulars to be issued regarding these uploaded and printed programmes. Time: 3:30 – 5:15 p.m.
Time: 12:40 – 1:45 p.m.
A lunch gathering and a guided school tour will be arranged to welcome F.1 students from primary schools other than MSCPS. Time: 12:40 – 3:00 p.m.
Students are required to attend the CCA Enrollment Day to enroll in CCA groups on 23/9 (Friday) after school (3:45 p.m. – 5:00 p.m.). All students need to make application through the CCA promotion booths on that day. Late application would NOT be accepted except for absentees. Teachers-in-charge would select the members of the following groups before the enrollment day. Thus, students cannot make application to these groups on the Enrollment Day. Students who cannot attend the meeting have to apply for leave by submitting a parent letter to their house advisors two school days in advance. For sick leave, students have to submit a parent letter to their house advisors on the next school day. Please be informed that the Mathematics Extended Modules Briefing Session for F.4 will be held after school from 3:30 to 4:30 p.m. on 4th November, 2016 (Fri). This is compulsory for all F.4 students. The Student and Parent Handbooks are for the easy reference of both students and parents. The content of the handbook covers information of the "parent-teacher correspondence", "school rules and regulations", "examination regulations", "assessment criteria", "remedial programs", co-curricular activities", etc. Parents are invited to make good use of the Handbook for getting to know us more and also for communicating with us. The electronic version of the Handbook is downloadable from the school homepage under “Administration | School Policy and Handbook”. Parents are also invited to view our homepage for the most updated information and a more comprehensive picture of the college. This year, details of school events will be announced through school homepage – MSC Portal. To be kept updated with school events, students and parents are reminded to visit the school homepage regularly. We would like to engage parents, students and staff on the Campus Development Project through praying to our Lord. May our Lord provide sufficient resources for the development project and protect all Munsangnites during the course of the development. May I wish my students a prosperous year 2016/2017 and thank you for your kind attention! 1. The class teacher of F.5D, Mr. Mok Ka-lun, has already contacted Carson. He is now safe and unhurt. 2. Chinese Embassy officials have arrived and are providing assistance. 3. The vice-chairperson of our School Council, Ms. Tsui Ka-wah, Jennifer, is in Germany. She has contacted Carson and proposed to provide assistance. 4. Hong Kong Immigration Department has deployed 4 officials to accompany Carson’s family members to visit Carson and his injured family members. 5. To avoid inconvenience caused by excessive greeting messages, please do not send messages or phone calls to Carson directly as he may have to handle more urgent matters at this stage. You are invited to include Carson’s family and other victims in your prayer, giving them good strength in body and soul to face and overcome difficulties. 6. This accident might cause emotional disturbance. Please be on alert of student’s emotional reactions towards this accident. For further assistance, please call our school office (Tel. number: 36553328) to contact Mr. Mok Ka-lun (F.5D Class Teacher), Ms. Chung Yau-lin (Counselling Mistress) or Mr. Lui Hang-sum, Louis (Assistant Principal). We are ready to render additional support. 7. The school is paying close attention to the case. We will provide appropriate support to Carson upon his return to Hong Kong. The latest progress will be updated through the school email on a need basis. Lastly, we sincerely invite you to uphold our school motto ‘All for One, One for all’ and earnestly pray for Carson’s family and other victims in the incident. May God bring comfort and heal upon them. 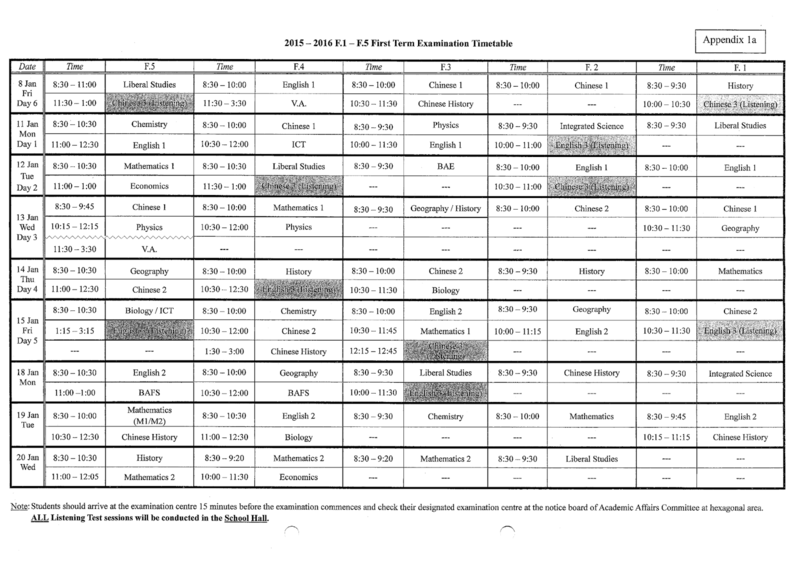 The Second Term Examination has been arranged from 2/6 (Thu) to 15/6 (Wed). Please refer to the attached for the Examination Timetable (Appendix 1) and note that the afternoon classes of all levels on 1st June 2016 (Wed) will be cancelled. Students are strongly advised to prepare well for the examination and strive for the best. In case of contingencies arising from bad weather which warrant announcement on suspension of schools by the Secretary for Education Bureau, the examination concerned will be postponed accordingly. For instance, if school is suspended on Monday, the examination originally scheduled for Monday will be held on Tuesday. 16th June 2016 (Thu) is the Marking Day. Students do not need to attend school on that day unless it is assigned as the fallback day of the examination. The Timetable will be released in due course. 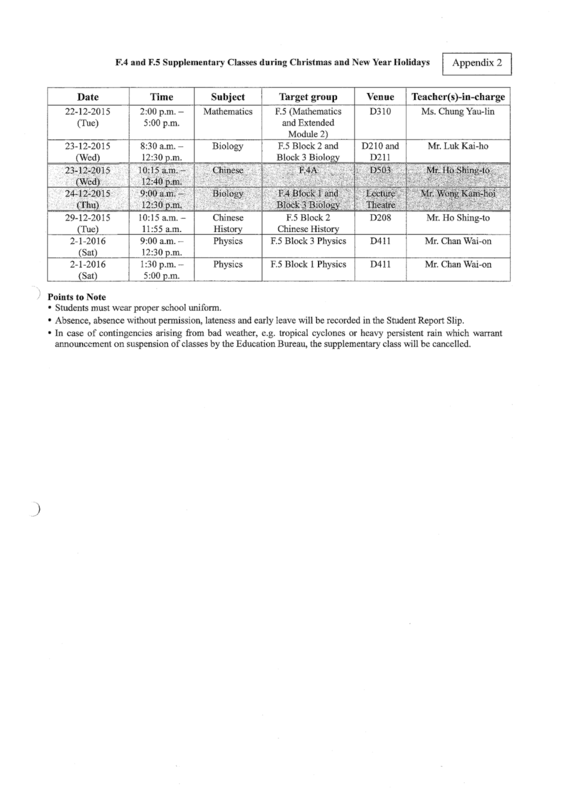 Please refer to the attached for the supplementary class timetable (Appendix 2). TSA for F.3 classes (Written Assessments in Chinese Language, English Language & Mathematics) has been scheduled for 21/6 (Tue) and 22/6 (Wed). Please refer to the attached TSA timetable for details (Appendix 3). All F.3 students are encouraged to adopt a serious attitude towards the assessments. Details of the venue and time for the supplementary test will be released in due course. All F.1 to F.5 students should take roll-call in their homerooms at 9:00 a.m. on 7th July 2016 (Thu) on which the report cards will be distributed to them. Parents are invited to review the performance of your children, sign the Report Cards and have them submitted to the class teachers on the Registration Day (8/7). All F.1 to F.5 students should take roll-call in their homerooms at 9:00 a.m. on 8th July 2016 (Fri) and produce the Report Cards with parents’ signatures for registration. The application forms will be distributed to the students on 7/7 (Thu). They should be returned to the class teacher by 8/7 (Fri) or the General Office from 8/7 (Fri) to 12/7 (Tue). Late application will not be accepted. In order to improve the academic performance of the F.1 to F.3 students, who fail to meet the minimum requirements for promotion of the school and so are promoted on trial, to the acceptable levels, the Academic Affairs Committee has arranged a Summer Performance Booster (Core subjects) for this group of students in the summer vacation. Details of the Assessment Criteria can be found in the Student and Parent Handbook 2015-2016 Page 51. The program is compulsory for the selected students who are promoted on trial. Circular will be issued to the selected students in due course. Parents are reminded to encourage students to try their best in academic pursuit and strive for a real balance between academics and activities. The 2016 F.5 Summer Supplementary Class Timetable will be released in due course. In case of contingencies arising from bad weather which warrant announcement on suspension of schools by the Secretary for Education Bureau, the supplementary class will be cancelled. Application Forms with the details of these schemes can now also be obtained from the school office. All applications should be handed directly to the SFAA Office by the end of May, 2016. For enquiries, please call the SFAA Office on 2802 2345. The Fund aims to enable financially needy students from P1 to S6 students to participate in life-wide learning programmes organised or recognised by schools for whole-person development. Programmes include visits (both local and overseas), field studies, community services, camps, extra-curricular activities, interest clubs and leadership training programmes. (iii) meeting the school's established “financially needy” criteria. Needy students can apply for subsidies from the fund directly via the school. Application forms can be obtained from Rachel Lam at the General Office. The completed application forms should be returned to Mr. Yu Kin Man at the General Office directly by 3rd June 2016. All the application details will be kept confidential. * Life Enrichment is a school-based curriculum introduced in F.1 and F.2 from 2016/17 onwards. It includes different learning elements such as study skills, value education, life and career planning, and project learning skills. Through the introduction of this new subject, junior form students would be equipped with not only a more solid knowledge foundation, but also be nurtured with positive attitudes and life values. Please refer to Appendix 4 (page 1 & page 2) for details. • Payment should be made through ePayment system on/before 17th June, 2016. • Fee to be submitted by cheque to the Class Teacher by 17th June, 2016. • Cheque to be made payable to “The Incorporated Management Committee of Munsang College”. • Name, class and contact number of student to be written on the back of the cheque. • Post-dated cheques not to be accepted. It must be noted that the submission of cheques carries no implication for securing a place at Munsang College of the next school year 2016 – 2017. The payment will NOT be debited or the cheque will NOT be cashed till 8th July, 2016 (Registration Day). Students who do not register eventually must submit a letter of withdrawal to the General Office by the Registration Day. The payment will be cancelled or the cheque will be returned to them immediately. Otherwise, fee refund of card replacement will not be made. The 74th Speech Day has been scheduled for 7th July 2016 (Thurs) at 3:00 p.m. at the School Hall. Mr. Yau Ying-sum William (Class 1970), Honorary Fellow of the Chinese University of Hong Kong, has kindly consented to address the gathering and present certificates and prizes. For the dress rehearsal, all graduates and prize winners must report to the teachers-in-charge at designated rooms at 10:00 a.m. on 7th July 2016 (Thu). All F.5 students are also invited to attend the ceremony and report to the teacher-in-charge at designated rooms at 1:30 p.m. Detailed information will be released in due course via the School Homepage and eClass mail. Students should refer to school homepage and AAC bulletin board for the seating arrangement (which is different from those for the First Term Form Test and Examination). Students should arrive at the examination centre 15 minutes before the test commences. Late candidates will not be given extra time to compensate for the time loss. There is no lesson for F.1 – F.5 after the test during the test period. Students are advised to go home immediately for revision. The normal lesson timetable will resume on 11/4/2016 (Mon, Day 6). No supplementary test would be arranged for absentees. Students are strongly advised to work hard for the Form Test and strive for their best. In order to improve the academic performance of F.1 to F.3 students who have obtained unsatisfactory results in Chinese, English, and/or Mathematics (core subjects), the Academic Affairs Committee has arranged a remedial program named Performance Booster for them in the Second Term. Students who failed in any of the core subjects (except Liberal Studies) in either the First Term Examination or the Second Term Form Test will be selected to join the Performance Booster from 25/4/2016 to 20/5/2016. Parents are reminded to encourage students to try their best in academic pursuit and strive for a real balance between academics and activities. TSA for F.3 classes (Speaking Tests in Chinese Language and English Language) has been scheduled for 19/4/2016 (Tue, Day 6) from 8:45 a.m. – 11:30 a.m. All F.3 students are strongly encouraged to adopt a serious attitude towards the assessments. Walk with them your open-mindedness, understanding and support and this will help you and your children in their course of choosing elective subjects for their senior years. Classes will be suspended all day as advised by the EDB. Students who have not left for school should stay home. School premises will be open and staffed until proper arrangements are made for arriving students to return home at an appropriate time. For enquiry, please call 3633 3429 (Guard Room) or 3655 3300 (General Office). School would continue the lessons until the end of the normal school hours and ensure that conditions are safe before allowing students to return home. The announcement of EDB on suspension of classes does not mean sending all students home immediately. Parents need not collect their children from school immediately. For enquiry, please call 3655 3300 (General Office). Classes will be suspended as advised by the EDB. Others Under exceptional circumstances which may affect normal school operation territory- or district-wide (e.g. spread of communicable diseases, severe flooding in individual districts, serious traffic obstruction, etc.) and in consideration of the safety of students, the EDB may advise all schools or the schools in only one or just a few districts to suspend classes. If Munsang College (located in “Kowloon City”) is on the list, students need not go to school. Besides, students who are living in that/those districts need not go to school. Students and parents should listen to radio or television announcements when heavy persistent rain or tropical cyclones affect Hong Kong. Parents may exercise their discretion in deciding whether or not to send their children to school at the time of inclement weather. Allowance will be given to the affected students for lateness or absence from school at parents’ discretion on the day when inclement weather or flooding occurs. They should keep their children at home if they consider that local weather, road, slope, traffic or transport conditions at that time have yet to resume normal. In response to emergency situations, the school may exercise discretion in making special arrangements in the light of the situation prevailing at the time, and/or having considered the advice of the relevant government departments. Examples include taking precautionary preventive measures (such as suspending classes) as proposed by the Centre for Health Protection in mitigating spread of communicable diseases in the school. In making school-based special arrangements under emergency, the safety of students is the prime consideration and disturbance to student learning would be kept to the minimum. The announcements of class suspension and re-arrangements of school events such as supplementary classes, tests and examinations during the period of class suspension will be made through our School Home Page and Munsang App as well as school circulars, if possible. For enquiries, please contact the General Office at 3655 3300. It has almost come to the time for celebrating the Year of Monkey in February 2016. 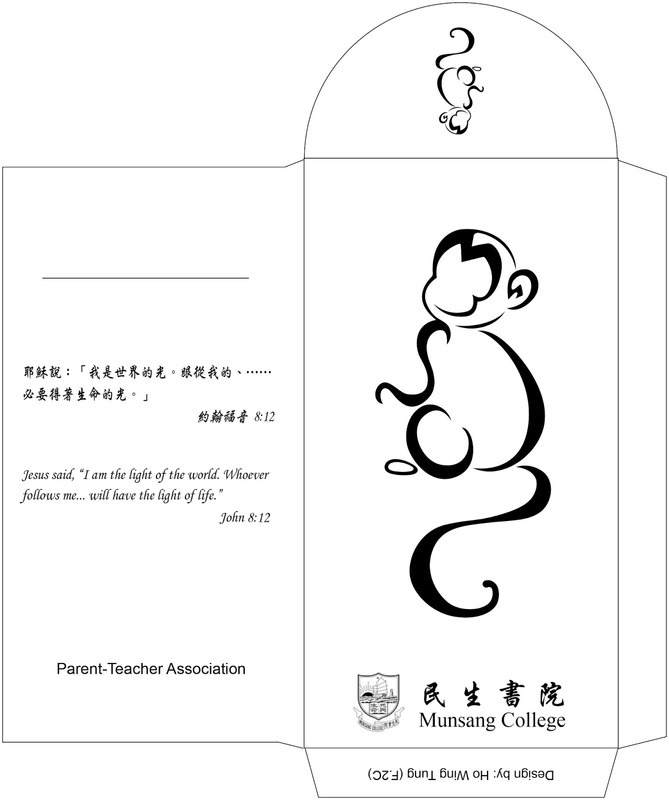 As previous years, I am proud to introduce to you the New Year red packet of Munsang College, i.e. carrying our School Logo, which is designed by our student, Ho Wing Tung of F.2C. You could refer to its spectacular design below. To place order, please kindly fill in the information required on the Reply Slip. In order to assess the teaching effectiveness of the college, stakeholder surveys are conducted annually to collect opinions from parents, teachers and students for the betterment of the school. This year, we would like to administer the stakeholder surveys in two stages for F.1 and F.6 students. Below is the arrangement for parents. Parents will be invited to complete the Parent Questionnaire (Secondary & Primary Schools) designed by the Education Bureau (EDB). The questionnaire is to be done anonymously and the multiple-choice (MC) answer sheets will be destroyed subsequently. The data collected will be processed by the computer and then submitted to the EDB. Each parent will be given a transparent plastic folder containing the Questionnaire, “Parent Questionnaire (Secondary & Primary Schools)” and a sheet of instructions. Parents are invited to read the instructions carefully before answering the questions and not to fold the MC answer sheets. Students must return the MC answer sheets together with the plastic folders to the Class Teachers in the Home Period by the following deadline. The Faculty of Dentistry of the University of Hong Kong would provide our F.1 – F.2 students with an oral (dental) health examination at the school. This oral examination has been scheduled for early February 2016 in school hours and is free of charge. All the participants are invited to complete a questionnaire before the examination. An oral health report would be sent to the parents of each participant after the examination. Besides, an online motivational interview conducted by dental professionals of the faculty would be arranged for the participants as follow-ups when needed. If you would like your child to join this event, please complete and return the corresponding reply slip. Please refer to Appendix 1a and 1b. Students should refer to school homepage and AAC bulletin board for the details of the Oral Examinations and the related seating arrangement. According to the assessment criteria stated in the Student and Parent Handbook (P.56), F.5 students who have the First Term Examination result below 30% of the full mark in the elective subjects are not allowed to take the subjects in the Second Term. Other F.5 students whose performance in the elective subjects were unsatisfactory may apply for withdrawal from the subject provided that they have at least 2 elective subjects for the HKDSE Examination. The application letter with parents’ signature should be submitted to Ms. Ting Man Shuk, Head of AAC, on or before 29th February 2016 (Monday). F.4 students taking Music are allowed to make application for withdrawal from the subject if they found their performance not satisfactory. 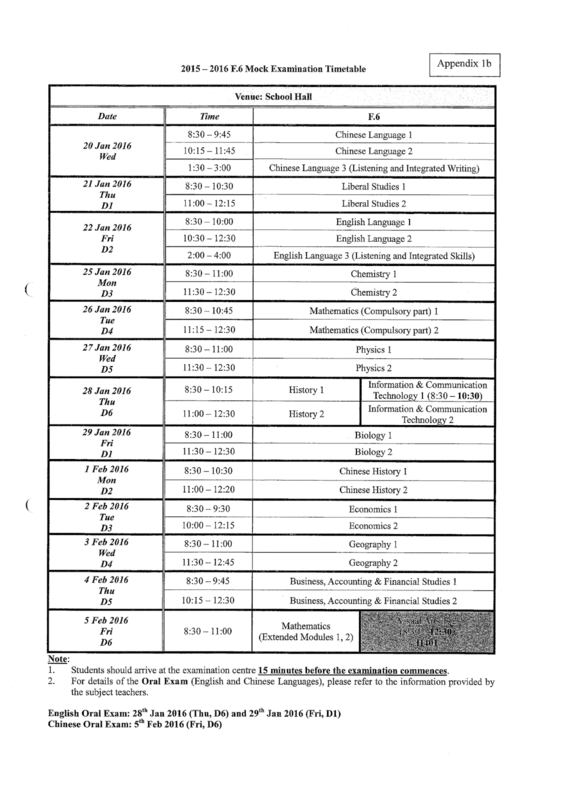 Please refer to Appendix 2 for the supplementary class timetable. Time: 8:30 a.m. – 3:20 p.m.
(b) staying in the home-rooms for the P.E. lesson. Time: 8:00 a.m. – 8:30 a.m.
(a) Students should collect their Examination Report Cards at the specified date and time. (b) Students should wear proper school uniform. (c) Students are not allowed to play in the playground. (d) Students are to keep quiet in the corridor and NOT to disturb classes having lessons. (e) Students should follow ALL the Health Cautious Measures of the school. For students who are unable to collect their Examination Report Cards should authorize in writing a representative to collect it. The letter should contain the following information: Name and Class of the student, Name and H.K. Identity Card number of the representative, and signatures of both the parent and student. (c) heavy burden incurred from school-based assessment (SBA). After detailed deliberation among teachers and careful consideration of the pros and cons, school administration has come up with the conclusion that there will NOT be a provision of places for F.6 places for repeat in 2016/2017. Students are strongly encouraged to try their best in the coming Mock Examination and HKDSE Examination. Commencing from the school year 2014/2015, F.3 students who ranked relatively low by the end of the school year (but not repeating) will be allocated to a F.4 class with two electives ONLY. The arrangement applies to all F.3 students and F.4 repeaters in 2016/2017. From 2016/17 onwards, in view of the reduction in the student population of F.3, in order to have more effective use of human resources, there will be no split class arrangement for F.4 level. However, to continue providing a flexible subject combination and a broad senior form curriculum, the number of elective subject groups will remain the same, i.e. 6 groups for 5 classes in a block. The Hong Kong Jockey Club Charities Trust has set up the Jockey Club Life-wide Learning Fund since 2002. The fund aims to support needy students (F.1 – F.6) to participate in school recognized and ‘fee-paying’ life-wide learning activities. Activities include visits (both local and overseas), field studies, community services, camps, extra-curricular activities, interest clubs and leadership training programmes. (c) students with financial difficulties. Needy students can apply for subsidies from the fund directly via the school. Application forms can be obtained from Connie Lam at the General Office. The completed application forms together with the receipt of payment should be returned to Mr. Yu Kin Man at the General Office directly before June 2016. All the application details will be kept confidential. As in 2014/2015 school year, the questionnaires are composed of 14 items and take students less than 15 minutes to complete. Statistical results will be sent to the subject teachers and the subject department heads concerned for evaluation of the learning and teaching effectiveness. Please make sure you have completed the survey by 11:59 p.m. on 17th December 2015 (Thursday). For F.6 level, you have to complete the questionnaire together with the stakeholder survey in the Class Teacher Period in early January 2016. Further details will be released in due course. • Spend time to talk with your children about their interests and careers aspirations so as to prepare them to think about their own career and life planning. • Walk with them with your open-mindedness, understanding and support, and this will help you and your children in their course of choosing elective subjects for their senior years. On behalf of the College, I would like to wish you all a Merry Christmas and a Blessed Year 2016 !